CHIREDZI – War vets of the liberation struggle were conspicuous by their ab-sence at a field day attended by their leader and Deputy Minister of Defence Victor Matemadanda in Chiredzi on Tuesday. It is a tradition in Zanu PF that when a leader graces a function in an area, all those who are under him either attend or are represented. 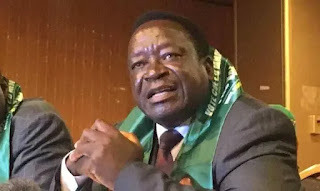 War vets from Masvingo were supposed to be represented at Matemadanda’s funcution who is their secretary general at the Zimbabwe National Liberation War Veterans Association (ZNLWA). It later emerged that the war veterans snubbed the function because it was being held at Retired Army Captain and war veteran Faster Gono's Hippo Valley Farm. Some of the war veterans accused Gono of feeding the leadership with lies and there are also suspicions that he is vying for the post of the provincial chairman for Masvingo war vets. ZLWVA Chairperson Ignatiuos Murindi said he did not attend the event because he was in Chimanimani seeing victims of Cyclone Idai. He also said he was not aware of Matemadanda's visit to the province. However The Mirror saw his party vehicle in town after the event. "I was not around l had visited Chimanimani to see victims of the cyclone which ravaged parts of Manicaland Province. I was not aware of the visit hence our failure to delegate some of our comrades to attend that event" said Murindi. Chiredzi District ZNLWA chairperson Killer Makuni said although his office was not notified about the event, Gono was a lost veteran of the struggle who survived on lying to the leadership of the party in Harare that's why they did not attend the event. "They did not invite us, that's why you did not see any war veteran at the function. On the other hand you should also know that some of the leaders are lost due to lies being peddled by Gono. He is a lost war veteran and we can't attend a function of people who do not work with others," said Makuni. ZANU PF Masvingo provincial executive also did not turn up for the function. Gono described his detractors as corrupt and said he was not worried by the absence of corrupt people. He said people hate working with him because he is against corruption.